No suncream. No sand. No sheikhs. No skyscrapers. Welcome to a weekend’s racing in Belgium with its crowds, cobbled tracks and muddy landscapes. The Omloop opens spring classics season and traditionally offers fine racing, often supplying action and suspense for hours. Starting and finishing in the city of Ghent the race occupies a triangular sector to the south of the city, criss-crossing roads to use as much of the terrain as possible. As the profile suggests, the first 100km are without too many obstacles. They tackle the infamous Muur van Geraardsbergen early, it helps to sap the legs before more and more climbs appear. Things get serious with 80km to go and the Kaperij climb, anyone badly positioned from now on is going to waste energy and pay for it sooner or later. 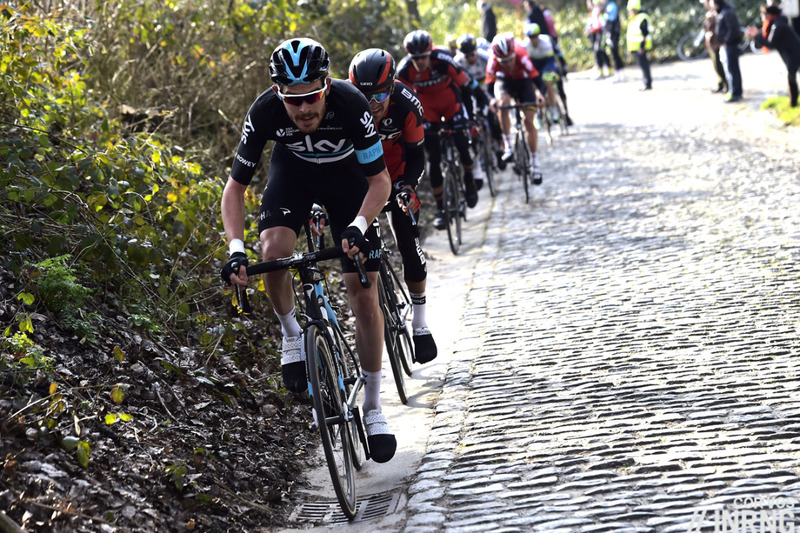 A succession of short climbs, cobbles and cobbled climbs ensures the process of attrition. 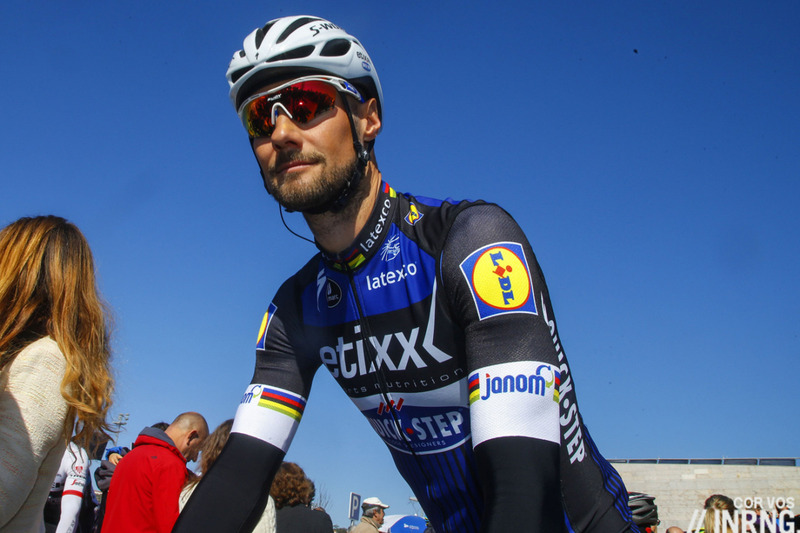 Watch for Tom Boonen on the Taaienberg and then a series of attacks, moves, splits and crashes will hone down the field. The Haaghoek cobbles are apparently a mess thanks to works. The final climb is the Molenberg, back after last year’s absence. The final cobbled sector is the Lange Munte, a long straight section that’s tiring but with a regular surface but very exposed to the wind. The same as last year’s new finish. The Emile Claaslaan is wide with a slight uphill drag to the line. Omloop is the local word for a loop, a circuit. The race began in 1945 as the Omloop Van Vlaanderen but the name was too similar to the Ronde Van Vlaanderen so it became the Omloop Het Volk, taking its name from the newspaper that organised it. For years the Het Volk and Het Nieuwsblad newspapers were fierce rivals, so much so that Het Nieuwsblad could not bring itself to call the race the Omloop Het Volk, using Gent-Gent instead. The enmity ended when the papers merged and the race is now called the Omloop Het Nieuwsblad. A pinch of salt? Get a shovel because predicting race results is never easy and it’s even harder when it comes to the opening race as form is harder to judge. 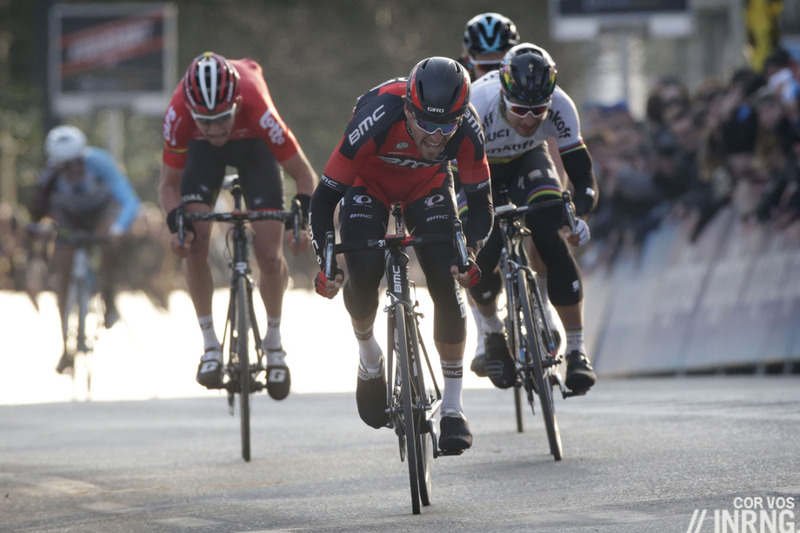 The easy pick is Greg Van Avermaet because he won last year and has the skillset and the team to repeat, as we saw a year ago he packs a good sprint from a small group. We don’t know much about his form but he was working well for his BMC Racing team in Oman. He’s got a strong team with Jean-Pierre “Jempy” Drucker as a dark horse for a sprint. 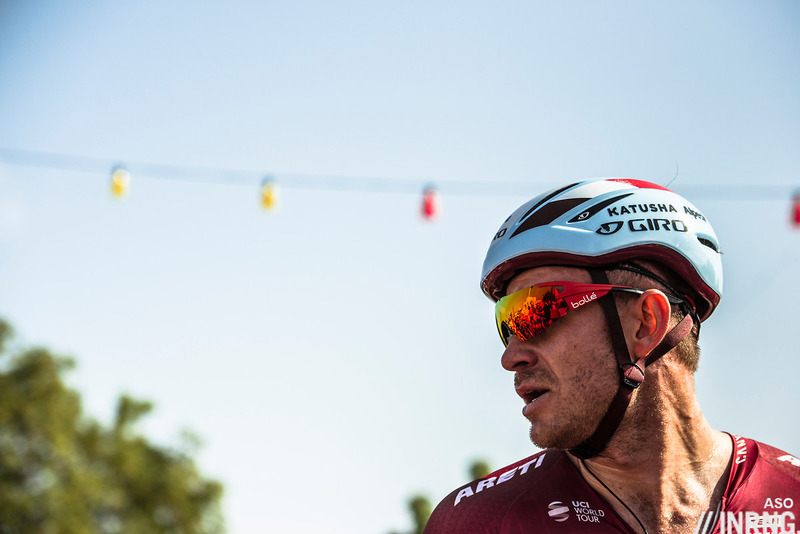 Alexander Kristoff is a dangerous rider in all the cobbled classics and is well suited to Saturday’s course. He’s shown in the Tour of Flanders that he can ride away but will surely prefer the sprint card so as strong as he may be, this race doesn’t often end in a bunch sprint, the last time a sizeable group arrived to contest the finish was in 2009. Watch Katusha-Alpecin team mate Tony Martin who says he’s been working on more explosive efforts in training because if he can zip away and get 10 metres then he’s very hard to bring back. Tom Boonen is the people’s choice. His looming retirement is going to be a perpetual theme this spring. The Omloop is the missing trophy in his collection of spring classics and he’s come close in recent years, think of his loss to Sep Vanmarcke in 2012 or Ian Stannard in 2015 so this isn’t a race where he just does a training test on the Taaienberg and rolls home. His form seems decent and he’s won already this year. His team is phenomenal, all seven other riders could plausibly win. Philippe Gilbert has won this race before and back to targeting the cobbled classics again so it’ll be interesting to see the team work. Iljo Keisse is the local pick, Zdeněk Štybar remains a classy rider but the longer flat approach doesn’t help him, instead Niki Terpstra could barge away while Matteo Trentin is another sprint card to play. The whole team is so strong that a “failure” to win will bring instant interrogation from the Belgian media. Sep Vanmarcke has joined Cannondale-Drapac and it’s almost a return to where things began for him as it was with the old Garmin team that he outsprinted Tom Boonen to win this race. Now he’s marked man and will find it harder to win but he’s got the raw power and if he’s had no particular results so far this season he’s looked very ease in the peloton. The team’s strong on paper with Dylan Van Baarle, Tom Van Asbroeck and 2011 winner Sebastian Langeveld as a road captain. Who’d bet against Peter Sagan? He’s got a fast sprint, he’s world champion and even if his goal is Paris-Roubaix – meaning his form is not on the boil yet – he remains one of those riders who seems able to win with one leg, see how he was almost winning stages Down Under with so little training. Marcus Burghardt and Aleksejs Saramotins are good recruits for Bora-Hansgrohe but the team still looks top-heavy, Sagan surely can’t sit tight for the sprint but will have to take risks. Team Sky bring their A-team with Ian Stannard, famous for his 2015 overwinning, and Luke Rowe who was the instigator of the big attacks last year on the Taaienberg’s last year and has shown his sprint in this race too. Gianni Moscon and Danny Van Poppel bring more options. Lotto-Soudal have struggled for years to win a “big” classic but they have a roster that can deliver if they get a few breaks. Jürgen Roelandts leads the team and packs a fast finish, as does Jens Debusschere who won the bunch sprint here a year ago. As of pixel time Tiesj Benoot isn’t down to start. Tiesj Benoot rides and is a prodigous talent but how can he win? He’s suited towards harder, hillier terrain and the flat run to the line won’t help him as we saw last year. Lotto-Jumbo lose Sep Vanmarcke and gain Lars Boom who’s back with a home team. He’s been good in the shorter classics but this one has a long run to the line but here Boom can always sit on any moves he joins because Dylan Groenewegen is there for the sprint, unless he’s already thinking about Sunday’s Kuurne-Brussels-Kuurne which looks ideal for him. Trek-Segafredo face life without Fabian Cancellara, one of the most bankable riders every spring. Jasper Stuyven can get away with others while Edward Theuns is useful for the sprint. Jens Keukeleire leads Orica-Scott with Luke Durbridge focussing on the classics again and Magnus Cort-Nielsen as a handy sprinter who has been seen to win in Spain but prior to joining the World Tour was at ease on cobbled races in the U23 ranks. Ag2r La Mondiale have beefed up for the classics with Stijn Vandenbergh and Oliver Naesen and there’s Alexis Gougeard for the morning breakaway too, remember he made the finish last year. Finally let’s rattle through some more names. FDJ’s Arnaud Démare is enjoying a good start to the season and packs a powerful, long sprint which has made his reputation but he’s really a classics rider at heart. Bahrein-Merida’s best rider on paper is Sonny Colbrelli but watch neo-pro David Per who is more suited to these northern races. Bryan Coquard‘s fine on the cobbles and hills but may sit tight for Sunday’s Kuurne-Brussels-Kuurne. Fortuneo-Vital Concept’s Dan McClay can’t because his team aren’t riding and he is back from training in Colombia which either means he’s flying or suffers from the thermal shock incurred when going from the tropics to Flanders. Finally a first with the Israel Cycling Academy team in the race where Kiwi Hamish Schreurs is one to watch, probably not for Saturday but one day in the future. Weather: cool and cloudy with 9°C in the afternoon. There will be a 20km/h breeze from the SW which is just maybe enough to help split things up, especially as several of the important later phases of the race run perpendicular to the wind direction. TV: the race starts at 11.35am Euro tome and local Belgian TV coverage starts at 1.30pm Euro time with studio introduction before the live racing and the finish is forecast for 4.35pm but tune in well before to watch the action. The Taaiennberg at around 3.00pm. The distribution rights vary a lot from country to country so check where you live and if not cyclingfans.com and steephill.tv serve up the pirate feeds. Women’s Race: the women’s edition is on while the men are still rolling with the finish forecast for 2.55pm. Ella Cyclingtips has an expert preview of the contenders and pretenders. Fixed, Vanmarcke for 2012 of course and Stannard’s win was in 2015. Here’s hoping for another fine edition to this spring classic curtain raiser. Great to get the Inrng lowdown on the race, thanks. Perhaps someone more focused on the win here while others are looking further down the line…maybe Theuns or Rowe with their turn of speed, though I wouldn’t mind seeing a Stannard 3 peat I suspect his eye is firmly on peaking for P-R. Of course that’s not how it worked out last year and the likes of the ultra talented Sagan and Van Avermaet can never be discounted it seems. Hard to see Greg taking it tomorrow after his ankle disrupted winter. GVA is talking up Boonen, who has a fantastic team behind him. Trouble is, who can take Sagan on in a one-to-one finish at the end, because he’s bound to be there. Looks like Tiesj actually is riding, he’s in the current startlists. And should probably be up there with the favorites. Thanks, it’s confirmed and I’ve added him to the piece above. He’s a great rider but how can he win today, he’s likely to arrive along with others and so far he’s been beaten in sprints like this. Finally some real races ..best time of the year ..Tiesj all the way ! Really looking forward to this, it feels like the start of the season proper to me. I’ll throw my hat in the ring and go for Stuyven. Some big Spartacus-shaped shoes for him to fill and I think he’ll be hugely motivated to get an early win on the board in 2017. Quickstep have an embarrassment of riches. Gilbert is intriguing. Hope he’s allowed free reign to shake things up. So excited to have proper hard men racing each other over tough terrain for the next few weeks. Somebody needs to explain to me how Phillipe Gilbert can win the Giro di Lombardia or on the Mur de Huy, but can also finish third in Flanders and win the Omloop twice. How can a cyclist be good at both? Boggles the mind. Gilbert has huge power (he was a one time Belgian ITT Champ too), he’s very race-smart, has a very punchy dash to the line and was sometimes lucky with the opposition and parcours. Valverde being suspended in 2011 for instance. Now, regarding that ‘uphill drag to the line’, it doesn’t really feel like that for a commuter cycling home from the station. ? Hugely excited – and thanks for the preview – by the start of some great racing (feels like an age). I’m going for the romantic notion of Boonen finally completing his classics set. Hard men rule. GVA, Sagan n Stuyven all contesting with Boonen hopefully keeping his powder dry for some epic spring racing! Roll on the classics. Only caught the highlights, but great to see “proper” racing again and what a finish by GVA! Your lead photo will become very confusing in the future, as to which year it was. Very true and I found the weekend was very similar to last year in many ways although this time last year both GVA and Sagan were highly rated riders but had question marks over their ability to deliver in the finish of a race, this time they both answered this in the space of one weekend. it did look suspiciously like Rowe was ‘happy’ with 3rd… all very commendable but not quite what Sky should be shooting for. Maybe that’s unfair, and it’s just that he’s continuing to build in these races, and in a year or two will have the chops and the experience to really test these guys in the final 5km. *Last year being his fourth place in Omloop, rather than this year’s KBK. sorry Michael that sounded like I was sniping at you, when I really was aiming at my first sentence! Don’t worry, didn’t take it that way at all but I think you made a good point. Cycling isn’t chess, and sometimes the legs just aren’t there, but on this occasion Rowe did have a match to burn, as shown by chasing down Trentin. I just think he lit it at the wrong time. Having said that as anyone who’s done competitive endurance sports at any level knows, your mind does get a bit fuzzy the deeper you go, and mistakes happen. Haha, yeah, when you initially get to the Inner Ring page and see the Omloop sprint picture, you think it’s from Inrng’s Results article, not the preview! I was hoping a reader might notice this but now sets up a hostage to fortune scenario for the next race preview. You may as well have Sagan on five chainrings for the rest of his Spring campaign, Inner Ring. Best World Champ for many a year…? The way he laid down the law at the end of KBK, oooofff. He’s amazing, no doubt, but wonder once it’s on the final few KM against smarter opposition – GVA, Degenkolb, Kristoff, Terpstra etc – if they won’t make it a bit tougher for him. Trentin and Rowe basically shared the workload and then lead Sagan out. Stuyven gave a big kick but left it too late. Still, agree Sagan looks immense again. I think that what we’ve seen the last season and a bit has been Sagan as the catalyst, and driving force, of many winning race breaks. He maybe uses a touch more gas than others in doing this and GVA and Kwia have been canny in eeking this out of Sagan. But rather this than the unsuccessful cat and mouse games of years gone by, when he refused to move and drag others with him. He wears the rainbow stripes well. And it’s great entertainment for the viewers. Yeah, agree with all that. Here’s hoping Sagan and GVA hold this level, Kristoff and Degenkolb hit it again, while Gaviria and Stuyven come through as the next generation. What a few years that would be for the Classics. So many potentially great riders with varying characteristics. Whichever race Sagan enters this Spring its going to be hard not to consider him a podium finisher. A man right on top of his game with many a card up his sleeve. A couple of the , ahem, “big” teams looked a little more than lacking this weekend! Early days yes but there’s going to be some awkward de-briefs this Spring. Side note, I watched KBK on Eurosport Player with the No Commentary option, just the sounds of the crowd, riders, motorbikes etc. I found it excellent, no babble to filter out. In fact I would rather have the hosts commentary, which I understand not a word, as oppose to the English commentary. To me it feels more authentic and I may even learn some words.